If you've been reading this blog a few years, or for the people who started with me with my first webpage of printables, you know that yearly I do an angel box of some sort. 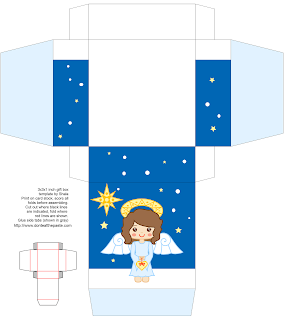 This year's angel uses the same body template as some of the Halloween boxes, but turned into a curly haired angel. I'll probably post the same box with other colors of hair and skin soon. This angel is inspired by my daughter and she gave me lots of tips while I was working on her. She also was the one who decided the gown length. When I said "She'll be standing in snow, won't her feet get cold?" TG replied "She's an ANGEL mom." Click on the printable box for a larger version, print on card stock, cut out, score, fold, glue. I'm going to be posting a few money cards like this one over the next few weeks, and I'd love some suggestions for what kinds of designs you'd like to see on the cards.